Here comes another face mask review! It's likely that there'll be a face mask in almost every empties post because I love using them so much. It's so soothing on the face! This sheet mask has a subtle but crisp peach scent. It smells like real peaches, not like the artificial, sugary peach smell that we sometimes get from other products. I didn't see much of a difference in terms of smoothness after using it (the effects are probably more visible after multiple uses of the same mask) but my skin did feel refreshed. 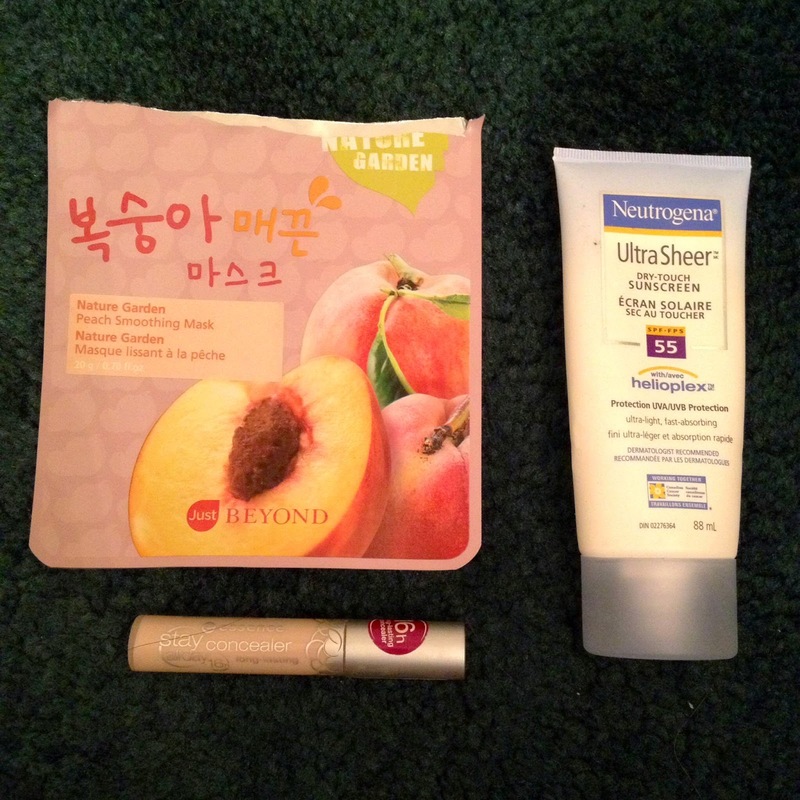 I have several more different Nature Garden masks to try out so I'm excited for those. You'll probably see them in future Empties post. This was one of the first under eye concealers I ever used and it was good for a concealer that only cost around $3! It had a great brightening effect that was able to cancel out my dark under eye circles. It says that it can last 16 hours which I feel like it did for the most part. If I put it on in the morning it would usually last till the late afternoon before the concealer has somehow come off and retouching is needed. The longevity of the concealer is improved if I lightly powder my under eye area after applying it. Unfortunately this particular concealer is now discontinued but Essence does have other concealers that may work for your different needs. This sunscreen does its job well. It dries quickly after I smother it all over my skin and it has the typical but not super strong sunscreen-y scent. I have tried using this on my face and it doesn't break me out (I personally feel more comfortable using a sunscreen that's meant for the face than using this one). I noticed that after the sunscreen dries it leaves a hint of shimmer on your skin which gives my skin a nice glow when I'm out in the sun. With an SPF of 55 I only need to reapply once if I'm out in the sun for an entire day. It's a good and affordable product for something that should be worn everyday in this hot, sunny weather. What empty products have you finished recently?